Club Penguin Cheats by Mimo777 Club Penguin Cheats by Mimo777: Club Penguin Rockhopper Reviewed By You! "Me and my buddies like dressing up and pretending we are pirates on his ship. We sail away to new islands and explore club penguin like it's a new island! Then we look for rockhopper! when we find him we dance with him, turn red, and bring our red puffles too!" Club Penguin will have an update on the Underground Cave later this week, so they would like to hear your bravest underground adventure you have been on with your buddies for next weeks Reviewed By You. I sure hope they tell us something cool about the new game, too. Don't you? i have met rockhopper three times! By the way u rock Mimo. coolio cant wait for rockhopper! you know what I've noticed? rockhopper comes more often now! Awesome! 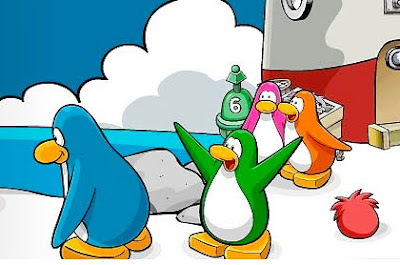 Cant wait for Rockhopper to come so we can PARTAY! :] On a much stranger note, i logged into CP today and i guess my penguin is 800 days old today...Strange. Guys, is Spring Break next week? uh yeah! I think so. wait! umm... YES! It is! Rockhopper is awesome! Mimo, I have a question though. I was in the town on the Rainbow server and I looked in my buddy list and it said undefined and when I clicked on it the picture never loaded, the weird thing is when I switched servers it was gone....what could it be? I've only met him twice. And yes, Mimo does rock! Your right, he does come more often! He used to come only about twice a year! Yes, Partay! My penguin is about 1200 days old. Don't worry, you'll meet both of them one day! You're right. They allow you to buy two of each type of puffle. Since the orange puffle came out, now you can buy 18! Yes, but I like some of the old items. He should bring back five of the bestselling items once! That was probably a glitch or the server was full so it took a reaalllyyy long time to load. Yes. Each time Club Penguin brings out a new puffle they increase the limit by two puffles. 800 days? 1039 days FTW! Hey Doopliss 677! How are you! Spring Break is differnet for everyone! If yours is soon, have a good one! Hey Rakatuki! You never know that you wont see Mimo. If you come to one for his partys, you can see him! Dont worry, Ive never meet Rockhopper or Mimo! But im still hoping! Hi again! I know you were answering someones question, but you may want to put there question down! Like I did, you copy and paste! You can use this comment as an example! I copyed and pasted, then made a bordered and responded! Try it out! And try to become a mod! Are you talking about a buddy you clicked on? Maybe that person deleted you. That coul be why when you switched servers it was gone. Hmm, tell me if it was different! Kewl, Mine is about 1250 days old, I think! And dont put "CPG Mod" after your name if you arent modding. Thanks! the puffle does not have any eyes in the pic. Heres a tip how to find famous penguins. Never look for them. If you look for them you won't find them. Ive met rockhopper three times,sensei four times,gary once, and pb once. Idk if this works for you though. It works for me. Sweet! Me too! And mimo will always be rocking. Awww don't give up! Just concentrate on mimo's party clues! I know you will meet him somebody just don't give up. That has happened to me before. Idk what it is. Maybe a mod is watching us? Who knows. Yup you were only aloud to have 16 puffles. They changed it because they have 2 times the amount of puffles that there are so since there 9 now instead of 8 its 18! For me half yes and half no. My penguin isn't really old because i started december 2008 and my penguin is 433 days old so i want old items but i will get mad if they bring back the red beanie thing. Really? I guess youre right! Pretty cool, Rockhopper's fun to meet, the more visits the better! Sweet, that means youre pretty rare :) By the way, Good Luck in the Haiku Contest, yours was funny and good LOL! Yeah, before the Orange Puffle came out members could only have 16. Whenever a new puffle comes out, the limit to the number of puffles you can own goes up by 2. Acutally, I think its just facing the other way, towards the water. That'd be cool though lol. i met him 5 times. if you ask him questions he answers it is cool . if you ask him to tell a story he does . he said he fav animal is a puffle. I've only met him once... but... *looks side to side* hmm... *cough* - he is mine! Are you sure rockhopper comes on thursday? Yup! He has a post about it!